The Casio WSD-F20A is powered by Google’s very own Wear OS. Through the Wear OS, users are able to tap into low-power GPS as well as full color maps with navigation, never mind that the watch continues to remain offline. 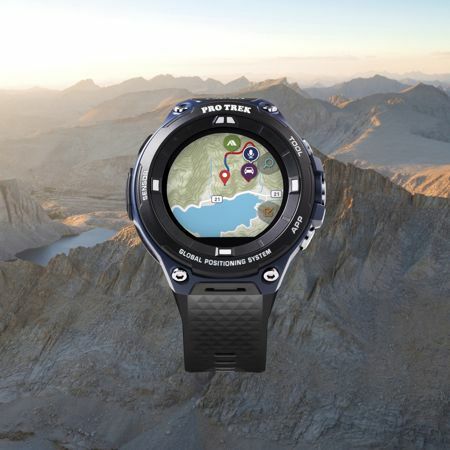 Maps can be downloaded before you even set out on your adventure, enabling these maps to remain accessible on the timepiece while you are out there in the middle of nowhere. The Casio WSD-F20A is able to support a wide range of outdoor and water activities, and works equally well in areas where there is no cellular service whatsoever. After all, when you want to get away from it all, why get bothered by incoming phone calls, right? This would free up users to be able to fully enjoy their adventures. Casio also has an understanding with nine major app companies, allowing them to offer popular outdoors and sports apps that have a global reach. All of these apps are showcased in the “Featured Apps” list, and among them include ViewRanger, Hole19, and Fishbrain. The Casio WSD-F20A will arrive in indigo accents and a soft black urethane band and buckle, accompanied by button guards, a protective bezel, and a trio of large side buttons for an enhanced design and operability. It is water resistant up to 50 meters, and adheres to the durability standards of 810G. Sensors include a digital compass, an altimeter, a barometer, and an activity tracker. A dual layer LCD is thrown into the mix for added toughness with a microphone to boot. All of that can be yours for $399 apiece when it hits the market later next month.